The simple enriched dough with eggs and butter was easy to work with. Most of work was done by the stand mixer anyway. It rose to great heights with a combination of room temperature and refrigerator fermentation. 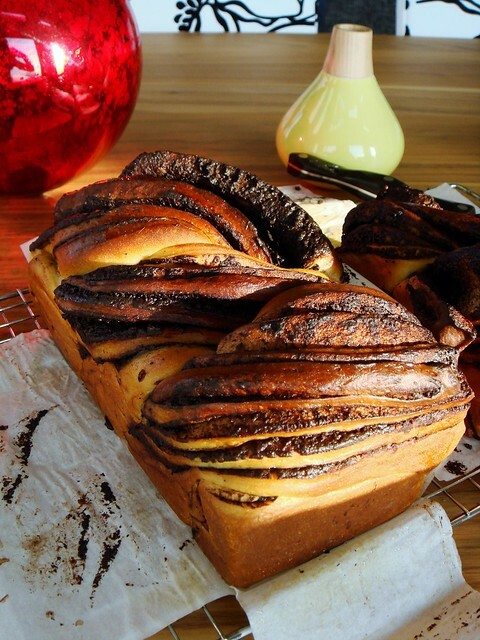 The chilled dough easily stretched to long thin sheet, all the better to create babka’s signature intricate swirls. Smitten kitchen’s advice to freeze the dough roll briefly before splitting lengthwise in half is key. Mine sliced easily without mess. 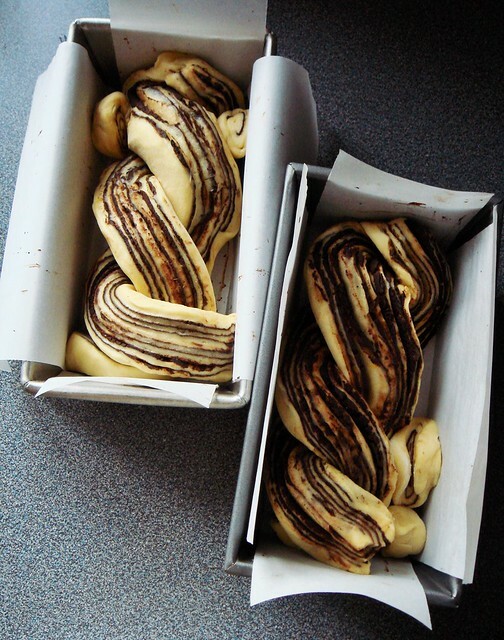 It was a joy to braid them into a twist showing all the beautifully swirled chocolate filling. I let my two loaves proofed during my hour long drive. 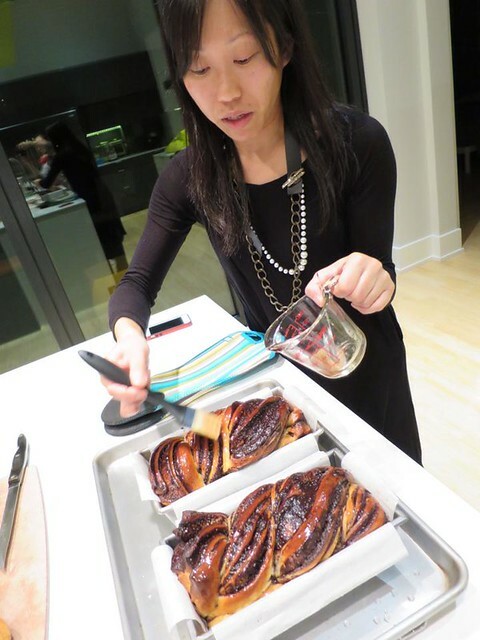 As soon as I stepped in the door, I asked my friends to preheat the oven because the babkas were ready to bake! Both were beautiful in their unique way yet equally enticing. The generous syrup glaze added shine and hints of sweetness as if the babkas were not already irresistible enough. 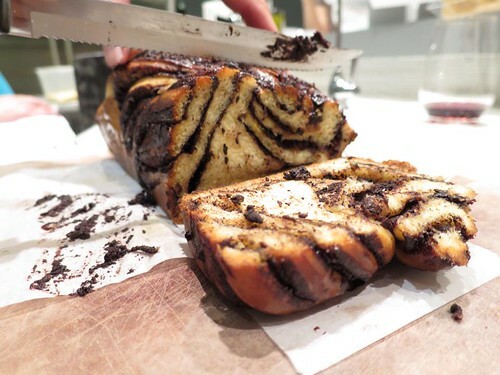 The timeless combination of buttery sweet bread punctuated with rich swirls of chocolate was incomparable. My friends and I greedily devoured our freshly baked bedtime snack. The next day was warm and beautiful, everything I could possibly asked for on an autumn day. We feasted, we drank, we sang, we watched movies, we had a great time. 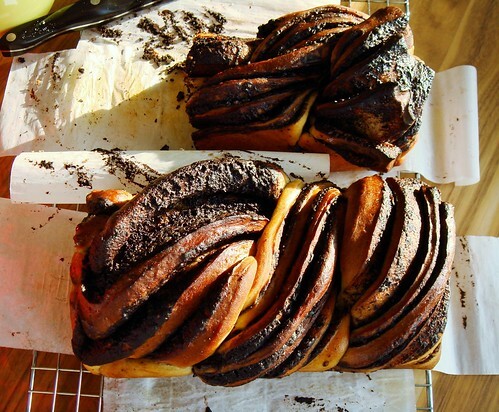 In the evening, I returned to the kitchen to check on the babkas. I looked forward to another taste of this baking success. To my horror, we were not the only ones attracted to chocolate babkas. Hundreds of fruit flies found their way to the sweet treat and made themselves comfortable. I still shudder at the memory of all the little bugs wiggling on the previously picture-perfect loaves. With equal amount of dismay and disgust, I threw away all the remaining babkas. They were definitely the fanciest fruit fly bait I ever made.